envisioning how carelink, a heart monitoring software, can transform to fit a wider audience’s needs, even in 5+ years. As part of my time at Sequence LLC, I worked with Medtronic's Cardiac Rhythm and Heart Failure team to reimagine CareLink, a patient monitoring + management product, to fit within a broader cardiac care setting. CareLink is currently limited to use for diabetic patients, but our team saw the potential for further integration into other departments. We developed a service strategy for what "CareLink in 5 years" could look like, and showcased our solution through conceptual interfaces + a vision video. I built interfaces that depended on a giant conglomerate of data. I was responsible for the UX/UI behind our proof-of-concept, posed as "the future of CareLink." The screens had to allow for clinical staff to easily identify patients in need of attention, get an overview of patient data at a glance, and access insights from both an individual and clinic-wide level. The biggest challenge was to build at a level where the interfaces were detailed enough to feel real, but still left room for interpretation in terms of data points and relevancy. The project dealt with many complex topics and structures—after all, it's healthcare—and figuring them out was part of the job. From researching competitors to holding interviews with providers from all over the world, I worked with designers, researchers, and leadership in capturing as much data as possible from every angle. Prior to the interviews, I was making materials + tools to help assist with data capturing. 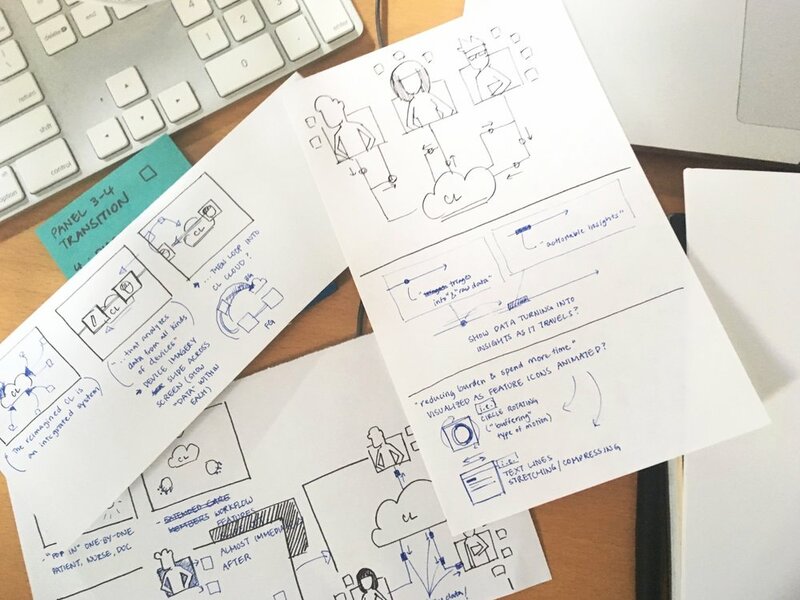 Through this, I was able to explore several ways to generate + utilize storyboards, some of which included future scenario storyboards, workflow maps, and feature showcases. I storyboarded + directed a vision video. I co-led the vision video development with a content strategist, working together to compose a script and deciding on tone, style, and the "story" we wanted to tell. I was the sole owner of bringing the script to life and coordinating with the visual designer + motion designer on the flow of the video. Having storyboards to talk through made communicating ideas easier, so—I flexed that skill here too. Our concept emphasized how our reimagined Carelink enables a more integrated, holistic care experience, putting the patient at the center of the story. It maps out how the threads of device information, holistic inputs, and smart clinical insights come together to enhance the quality of that his/her care, inspire communication across his care team, and empower the patient to play an active role.